The new Four Source, Four Zone (4x4) version is a compact version of the revolutionary Hi-Fi 2 distributed audio system, ideal for controlling, sharing and listening to audio systems in townhomes, luxury hotel suites, condominiums and small office buildings. The system can be controlled via the included remote control, from an included wall-mounted Volume Source Control, or directly by the free Android or iPhone applications. Audio sources can be located throughout the house using Remote Input Modules, or sources can be locally connected at the Hi-Fi 2 amplifier. Local input examples include items like satellite, broadcast, and Internet radio tuners. Remote input examples include a home theater system, kitchen TV, iPod dock, etc. The 4x4 system provides a maximum of four zones and four sources of audio. 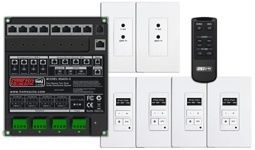 If more capability is required, HAI by Leviton suggests the larger Hi-Fi 2 8 Zone, 8 Source system that provides 8 zones and 8 sources; however, it may be expanded to 16 zones and 8 sources. Hi-Fi 2 4x4 may be a stand-alone installation or may be integrated with an HAI by Leviton home control system for audio automation based on schedule or activity, in addition to announcements/paging.